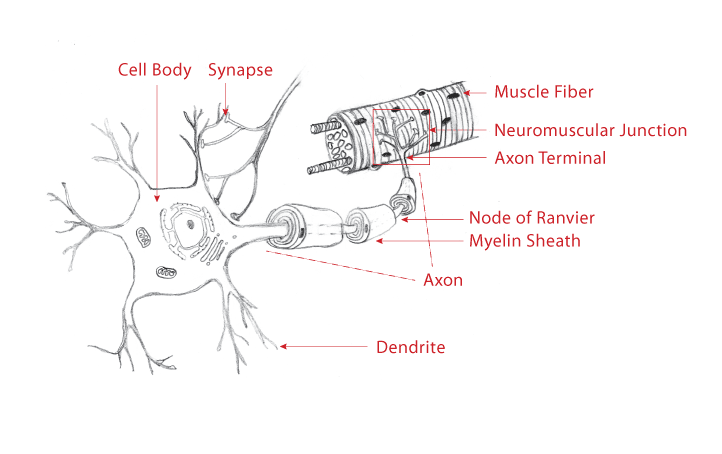 A myelin sheath is an insulating layer that is wrapped around an axon. In the peripheral nervous system, each myelin sheath is formed by an individual Schwann cell which wraps itself around the axon length. In the central nervous system, oligodendrocytes send out numerous processes (arms!) to wrap multiple axons. So myelin is actually just layers and layers of phospholipid membrane! The insulating properties of myelin allow the action potential to be conducted along the axon at high velocity. This is because action potentials are formed only at the points along the axon which are not myelinated (called the nodes of Ranvier). Voltage-gated Na+ channels are located in these gaps. An action potential at one node causes an action potential in the neighboring node, thus "skipping" the myelinated section. This propagation of action potential is called saltatory conduction. The loss of myelin can cause severe physical problems such as blindness, motor problems, imbalance and speech impairments. Multiple sclerosis is one such disease.